My baby is one - how cool is that!! Much excitement from Josh yesterday and lots of ooh and aghhs from Samuel. 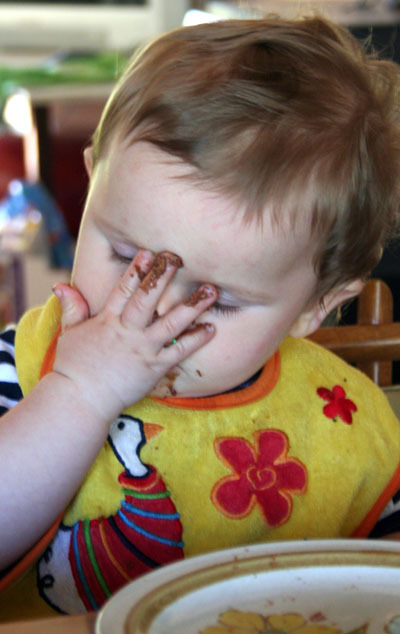 You should have seen him hoe into the choccy cake Mum and Josh made him- so cute! We had a little party with hats and balloons and trumpets and then spent the rest of the day pottering about whch was lovely. The weather has been divine, The sky always seems more blue over here for some reason. Today we might take the boys out for a day - maybe to an animal farm near Dunsborough or on the train to the end of the Buselton jetty. It's lovely to be able to see the excitement on their faces when they do / see new things. Josh is especially loving helping Gran 'on the farm' as he calls it! Well actually we were here Monday night, but it's taken me until now to recover! 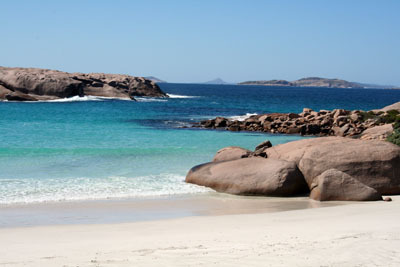 We left Esperance latish on Monday morning because of course I had to do the photo thing in Esperance. We went to Pink lake (which wasn't looking very pink) and then along the beach drive which is so spectacular. Beautiful azure blue water and white beaches - all you need is some orange bazzill! 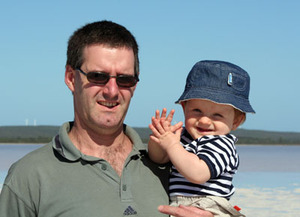 This one is of Paul and bubs out on Pink Lake (a salt lake) - Josh was very fascinated by this! We headed off across the south-west corner of WA towards Busselton - about 700k. It wasn't as far, but was very hilly and windy and combined with driving into the son and two overtired boys, we were very glad to make it to Mums at 8pm! One of the highlights of this trip for Josh was looking up and seeing a flock of sheep running along the road as a farmer was moving them into another paddock. You don't see that in Melbourne! Josh was soooo excited to see Gran and needed a grand tour of everywhere! Even though he has been here a few tomes, I think this is the first time he has really been able to enjoy Mum's big open spaces (she lives on the outskirts of town on 1.25 acres which is so peaceful - all you can hear are the birds!). Mum has a mare Bella in her backyard as well, so Josh is enjoying feeding her and talking to her. We have just been pottering around the last couple of days which has been lovely - we have located a big adventure playground and lined up some fun places to visit. 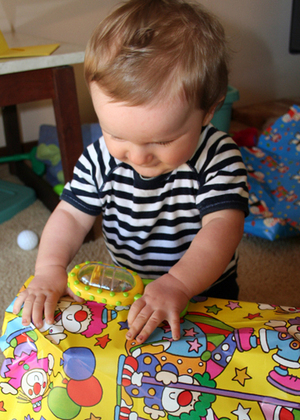 Josh and I have been into town today to do some shopping for a little party for bubs 1st birthday tomorrow! My little baby will be one, can you believe that? I checked out the scrapbook shop in Busselton today (which was actually a few shops in a stationery shop) - let's just say I won't be going broke from shopping there. But....... have found out Scrapboxx have a shopfront and it's less than an hours drive through the wineries to get there - WOOHOOOOOOOOOOO - looks like I will be paying them a visit. Took some pics around Mums place today. Will post later. 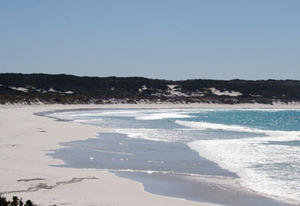 Lovely to wake up this morning in one of my favourite places, Esperance. It's such a lovely little seaside town, and I have been here so many times but it still is a magic place for me. We got here late yesterday afternoon, and we were all pretty tired after another 900+km drive yesterday. We are staying at the Seafont Caravan Park, but in thee very nice brick units. Three bedrooms, huge comfy couches, would be a great place for a lengthy stay if you are visiting Esperance. Has a playground right on the ocean front so Josh was happy. I was too tired to post last night - instead had a relax and a read in bed of the new Scrapbook Memories mag. How cute is that layout by Maxine H on the cover - she is so talented. We are going to have a look around Esperane this morning and then head across the south west corner of WA to Mums house in Busselton. Should be there late afternoon. Will be so great to see Mum - her place is just so relaxing with heaps of space for the boys to run around. Mum has her horse Bella at home, so Josh will enjoy helping Gran feed her and watching her mow the lawn in the backyard (Mum lets her out to graze n the lawn!). Will post again tonight with some pics of Esperance in the day time. It is such a beautiful place. Just to end though, here's a little something for the lovely Soovee in Melbourne from Balladonia Roadhouse today. How cool is this – driving along blogging. I’ll have internet access again tonight so I can post - woohoo. Isn’t amazing how lost you feel without something that a few years ago you were totally happy without! You might want to grab yourself a coffee as I am bored driving along so this will be a long one! Can someone call Ashton’s circus for a sign up form – we definitely have a clown in the making with the name of Samuel. Wouldn’t it be funny to play peekaboo over the edge of the porta cot and throw his dummy over the edge while Mum and Dad and Josh are trying to sleep? Wouldn’t it be funny to do it all again at 4.30am as well? Not. Little ratbag – he sleeps all day and plays all night. At the moment he is cacking himself at Josh who is putting Ted E Bear on his head and letting it fall off. They are traveling really well, I am very proud of them being so adaptable. Now onto yesterday travels. We got up early and left Port Augusta at 6am to drive across the top of the Eyre Peninsulato Ce duna (about 500k). This is a pretty desolate area, just a few tiny towns along the way. Ws stopped at Kimba which is half way across Australia according to the sign, for a coffee and to give Samuel some breaky (he isn’t backward in telling us when it’s time to eat!) .They have a huge Cockatoo (what is it about Australia and big things – big pineapple, big orange, big banana, big cocky and I’m sure there are zillions more) which Josh was impressed with. He was even more impressed with the cocky in the cage, who was talking his head off. I think this is the first time he had seen a cocky talk and he couldn’t believe his ears! ‘Hello mate, how are you’ and ‘Hello Cocky’. I think the isolation might be getting to him though, as he said the most hellos when we walked away from the cage. I guess Goodbye is harder for cocky’s to master. We also had a toilet stop at Poochera, and Josh was pleased to discover a little hut that a man used to live in that he had made out of wood and flattened kerosene cans. Think it would have got very hot in summer! Onto Ceduna for lunch by the ocean – took some nice pics, but other than that it was a bit of a disaster as it was really hot and the salt water stung Josh’s eczema on his legs. 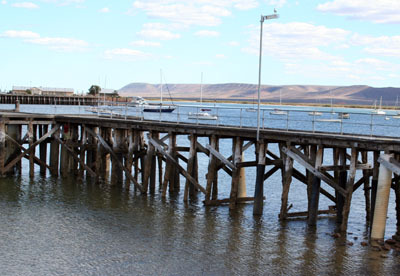 The foreshore area is quite nice, but other than that there is something about this town that we don’t like so we have only ever stayed there once. There was one highlight though (Kathy Smith – you will appreciate my excitement here) – when I was buying lunch, the shop had little signs made out of bazzill (scrapbook product for the non-scrapbooker). Ceduna is the start of the big drive across the Nullabor, but it’s actually quite interesting. The drive across the Eyre Peninsula (Port Augusta to Ceduna) is the most boring part for me. 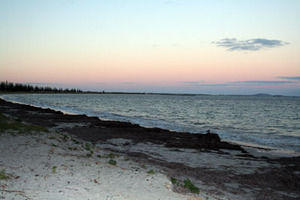 We left Ceduna about 2ish heading for Eucla (468km away). 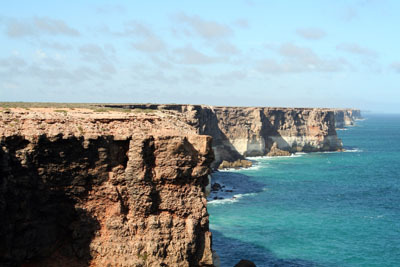 Passed the Yalata whale watching turnoff – there is a 16km drive to the Great Australian Bight Marine Park where between June and October you can view Southern Great Whales and their calves. We have been there on a previous visit, but the timing was out this trip. I took over driving for a while to give Paul a break. He and Samuel were snoozing, and Josh was chatting away about the gang of bikies we saw drive past (and four police cars in about 5km). The highlight for me was the lookouts about 100km east of Eucla where you can view the Nullabor cliffs. These are absolutely breathtaking. We held on tight to Josh and Samuel as it was really windy (would have needed a cycle to blow me over the edgeL)! Got some nice pics and these will definitely make the scrapbook! I have even been thinking about which colour bazzill will match, LOL (I am having withdrawal symptoms from no scrapping for 3 days). 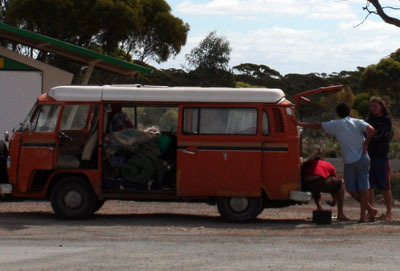 Just before Eucla we went through the agricultural check point on the SA/WA border. Josh was very intrigued as to why the man wanted to know if we had any fruit, honey, foam boxes, seeds etc. He was obviously concerned this morning still as when we were driving along he wanted to know how we can eat fruit in WA if we had to give it all to the man. He also suggested that we put plastic on the fruit so the fruit fly doesn’t get in. Smart cookie. 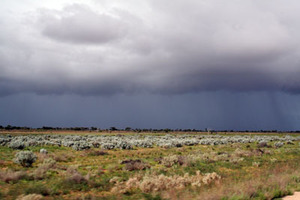 It was lovely and cool when we reached Eucla – in fact it had started to rain. Josh had had his heart set on a swim though, so we bravely took him o the pool in between showers – his ‘swim’ consisted of Paul (who didn’t have his bathers on) standing in the water and holding Josh (who had his bathers on and only got his toes wet! Eucla is like an Oasis in the desert and I would recommend it as the best stop over point across the Nullabor. The motel is old but the rooms are clean and tidy, and there is a nice restaurant where you can get proper meals including veggies which I was craving by now! I had roast lamb and veggies followed by sticky date pudding – yummy! Josh was also very impressed with his huge hotdog that he ate the whole lot of! Josh had a nice time chatting away to the other diners and telling everyone he was going to Perth. He even passed the cook a compliment “Hey lady – this is a yummy hotdog” and earnt himself a free icecream to take back to the room! Josh wasn’t very impressed our ‘house’ last night didn’t have a kitchen (I was very impressed!). With the help of Samuel we were awake before 5am this morning and on the road before sunrise keeping a keen eye out for kangaroos. It’s a much cooler day today which is nice. 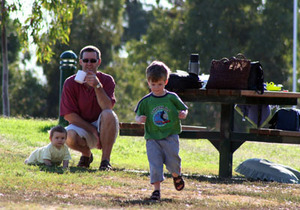 Samuel decided pretty early on he needed food, so we stopped and had breaky with the truckies at Mundrabilla. This is a driver change over area for east – west truck drivers, so is really well set up for meals. Josh was very impressed by all the trucks – there was a huge 3 carriage road train which he was particularly impressed with. Drove on through the Madura Pass (nice scenery if I hadn’t been asleep!) and then past Caiguna onto the longest straight stretch of road in Australia between Caiguna and Baladonia where we are still driving along. 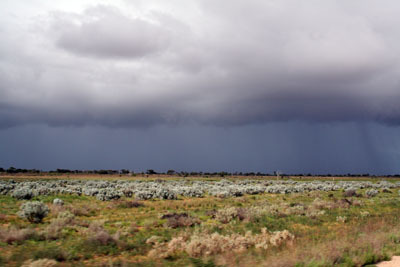 I took some pics as we were driving along towards some rain, the contrast of the rainclouds and landscape was interesting. We are only about 15km from the Balladonia roadhouse, This is a good one (with yummy steak sandwiches) so we will be stopping for an early lunch. It was near here that some of the Skylab debris fell to earth, so they even have a little museum (I think I recall a stuffed camel as well which Josh should get some fun out of!). Will sign off now and do another post of Balladonia to Esperance tonight. Only 193k to Noresman which is the end of the Nullabor part! Pretty relaxed day today - didn't leave our cabin until after 10, then had to pop into the Gawler scrapbook shop 'Scrapbook Country' where I picked up the a mag to read and had a little look around - very impressed to see they had the new Basic Grey! 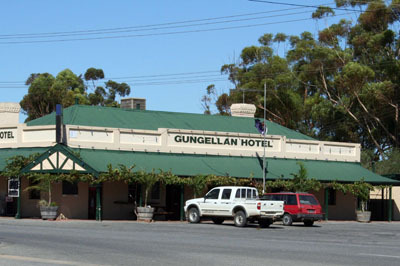 Then we headed up to Freeling and saw the Gungellan Pub from McLeods daughters set - not a McLeod in site though - pretty cool all the same. Then headed through the beautiful Clare Valley- I love this part of South Australia. I am definitely heading back for a couple of weeks of liesurely holidaying in this region one day. 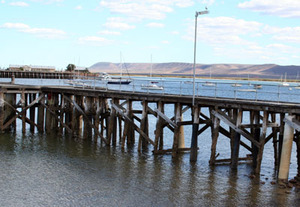 I'd love to walk the riesling trail between Auburn and Clare (25km, better get into shape!) and it's a wine and foodies paradise! We had lunch there then headed up to rejoin Highway one and into Port Augusta to stay at the Big 4 Tourist Park. We did some shopping ready for the big drives ahead and then headed to the pool which is only 50m from our door! 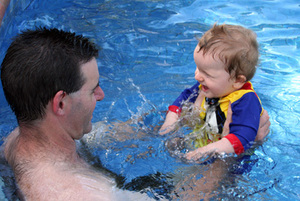 The boys had a ball splashing around (it was 35 here today, but didn't feel that hot) and then it was back to the cabin for tacos and an early night (except for Claire the night owl!). Up early in the morning as we have a long drive - will be staying in Eucla (middle of Nullabor) - they have no mobile coverage, but a great restaurant and bar, so can't complain! We always stay there - so we know it well.The first time we went over with josh we had to bathe him in the hand basin (he was 6 months) - no way Samuel will fit in there! 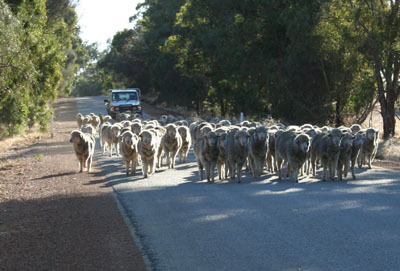 Here's a great site with maps of the Nullabor and description of the towns if you want to follow us over the next couple of days. Have loaded more pics into the picture album, some from today and yesterday. Have got the hang of this picture resizing now! This is probably my fave from yesterday, although Josh will say the monster ones in the album! Will post again from Esperance Sunday night.